We were delighted to present Pathways Community and Support Association with a laptop and printer. Pathways provides addiction support services enabling people to lead contented and fulfilled lives, free from all forms of substance dependency. It does this by providing second and third stage accommodation to those who are committed to leading an abstinent lifestyle and wish to move towards healthy and independent living. There are plans in the future to provide fourth stage accommodation. Pathways also aims to work in partnership with other organisations to reduce the level of drug and alcohol dependency within the Weston-super-Mare and North Somerset regions, and the consequent damage to individuals, their families and the community. Pathways provides information and support to their clients that need help with benefits. The laptop and printer will be used as an IT resource that is dedicated to these PCSA clients. As the channel shift for services to become digitised moves forward, PCSA will be ready to meet the increased demand for support with claiming benefits online. 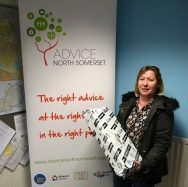 The first round of Go4IT produced four awards – Pathways, Vision North Somerset, Addaction and North Somerset Training.